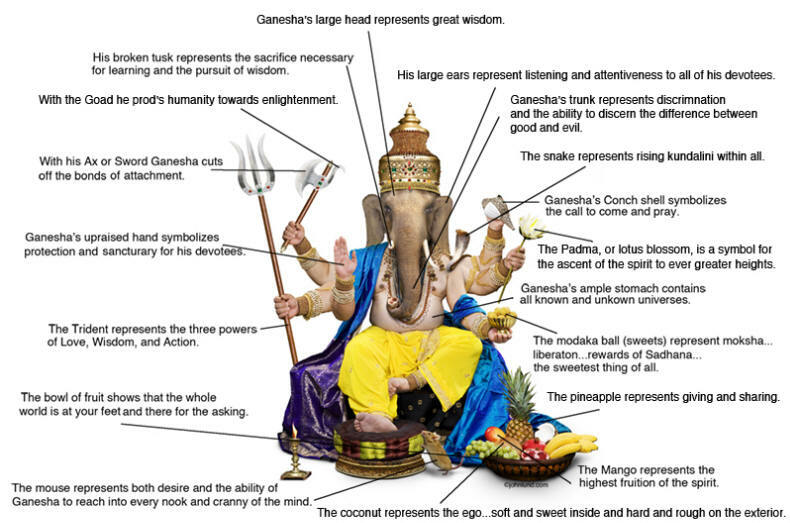 The picture of the Hindu God Ganesh shown below explains some of the Hindu Symbols present in the photo. Ganesha, or Ganesh, is perhaps the most beloved of Hindu Gods…and with little wonder as he is the God of Prosperity, The Remover of All Obstacles (Avighna), the Lord of all Gods (Ganapati), and the Bestower of Success (Siddhivinayaka). He is the son of Shiva and Pavrati. Lord Ganesha actually has many other names as well, but these will suffice for now. Ganesha is portrayed with multiple arms and hands. It is, in fact, taboo to show him with only two arms. In most illustrations Ganesha has four arms but can also be portrayed with up to sixteen or even twenty. His arms hands and arms are held in symbolic gesture or they are holding symbolic items. Some of the objects are also placed at his feet. The sacred -elements range from fruit and flowers to tools and weapons and have primarily a spiritual significance. Different sources, however, do have varying interpretations of the symbolic meanings…the ones I have chosen here are the most often referred to. We will save the myriad of fascinating stories of Ganesha for another chapter. Lets start with the Weapons of the God of prosperity. Ganesha is almost always portrayed with an ax or Mahaparashu. The ax is symbolic primarily for cutting the bonds of attachment…though some interpretations have it that the ax is a symbol of protection for his devotees. The axes can range from a battle-axe, to a “large” axe to a pick ax (in the case of the pick ax it also refers to Ganesha’s ability to “pick away” at the foibles and misconceptions of his worshipers. Sometimes Ganesha is portrayed with a sword, which can again be symbolic of both cutting away attachments and also of protection for his devotees. The trident or Trishula that he is sometimes pictured with refers to the three spiritual weapons of Love, Wisdom and Action. Sometimes Ganesha wields a dagger, a chhuri, the razor’s edge of which signifies the narrow path that must be walked to achieve higher spirituality. A Mace, or Gada, is indicative of Ganesha’s decisiveness and discipline as he continuously pushes his devotees in the spiritual quest until completion. At times the Lord Ganesha is seen holding a Vajratrishula or lightning bolt. The lightning bolt symbolizes spirit over mind and mind over matter. Another of Ganesha’s “spiritual weapons” is the Chakra or discus. The discus represents the sun and the mind and is thusly a powerful weapon. The noose, or Pasha, is yet another of Ganesha’s weapons…this one used to pull “wandering” devotees closer to spirituality. Tools are another category of symbolic objects in Ganesha’s possession. The goad or Ankusha, is used to prod those who tary on the path to spirituality. Loving Ganesha often carries a Kamandalu, water vessel, and a symbol of fullness and of meeting the needs of others. A Mudgara is a hammer to represent his role as the Patron of Arts and Crafts…protector of all who build and construct for the good of others. Ganesha is sometimes seen holding his own broken tusk, which he uses, as a pen to write scriptures with as Vyasa dictates them. He teaches us that we must finish what we start…and that sacrifice is necessary in the persuit of learning and higher spirituality. Ganesha has been known to use a bow of sugar cane, an Ikshukarmuka that he uses to shoot benevolent arrows of living thoughts. He uses a Vina, an Indian Lute, demonstrating that Ganesha is sound, he is everything. He teaches us to listen within. Ganesha carries a stick, a Danda, a symbol of his authority and a warning not to resist dharma. A fly-whisk, or Chamara, is used by the Loving Lord Ganesha to fan memories of the past from the minds of his followers and help them reside in the present. Often Ganesha has Shastra or scripture at his feet…he is a student of life and writes and comments on our existence. Also at Ganesha’s feet one can often find a basket of fruit or Phala. The fruit represents the world at our feet…there for our asking. The Amra, or mango, represents spiritual fruition. A mouse, or Mushika, is always shown at his feet representing his ability to get into the smallest corner and openings of the mind…and to represent desire that we must control. Ganesha’s humility is demonstrated by the fact that the diminutive mouse often carries him on his spiritual journeys. Powerful and loving Ganesha is still a gentle vegetarian seen with a pomegranate, the seeds of which are red, like meat and blood, but are still sweet and good. In his hand he holds Modaka, sweet rice balls, symbolic of the ultimate sweetness…that of enlightenment. 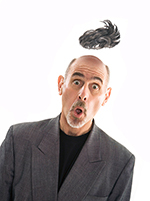 A coconut is used to show the ego which has a hard outer-shell and is sweet and soft inside. The Lotus blossom (Padma) in Ganesha’s hand symbolizes spiritual awakening as the blossom rises up in beauty from the foul swamp waters. His upright hand shows His compassion for and protection of his devotees and is often portrayed with the symbol Aum, the cosmic sound that represents the oneness of all. His trunk represents discernment, which is necessary to successfully negotiate the path of spirituality. Ganesha’s large belly, Lambodara, symbolizes his ability to peacefully digest all is good and bad in life. A snake, or Naga, is often shown on Ganesha’s shoulder indicative of Kundalini energy rising. Ganesha is a powerful and loving God rich in colorful stories and symbolism. He is a figure that we can all use to remind of the more noble paths that we might walk.